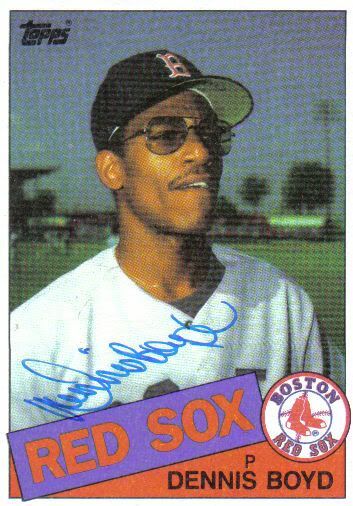 Oil Can Boyd is a right-handed pitcher who did most of his Pawtucket time in 1983, with a handful of games in 1984 and 1987. In '83, at the age of 23, Boyd started 17 games and finished the season with a 4.04 ERA. 3.15 SO/BB, if you will. He pitched nine complete games. I'm like a broken Shangri-La's record going, "Oh, no. Oh, no. Oh, no no no no no" over and over without ever getting to the "Remember!" and the finger-snapping, but NINE GAMES! Evidently, 1983 is a lot like 1883, except Boyd wears a glove and doesn't smell like whore juice. Boyd's smattering of other games, other seasons are of no import, so I've opted not to include them here. 1. 1983 - Boyd's 129 K's place him third on the IL's strikeout leader board. 2. Boyd has two 15 strikeout games for Pawtucket - One in '83, the other in '84. He broke the 14 K record previously held by Burke Suter. Boyd shares his record with Jin Ho Cho. Such elite company! Oil Can Boyd's mural is tucked away in the upper turret of the third base tower. I don't think I've seen it, so I'm going to wear a black robber suit and a black robber mask and a black robber beret and break into the park to take a look. I will tiptoe exaggeratedly up the ramp, and then perhaps slink off into the night carrying a sack with a big dollar sign on it. Which is way more exciting than some stinky football game.